A woman has admitted driving with excess alcohol on the day of her son's wedding. A bridegroom's mother was caught drink driving on the day of her son's wedding, after her estranged husband turned up with his new love, a court heard. Jean Cutler, who said she had four glasses of wine, was almost twice the legal limit when she was stopped by police at midnight on her way home after the reception. 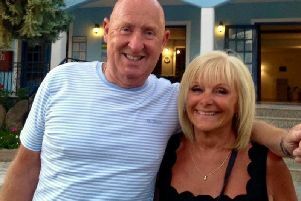 Burnley magistrates were told Cutler had been married for 33 years but was now currently involved in divorce proceedings with her estranged husband and she was very upset after she saw him with his new partner. The 54-year-old defendant blew 64 microgrammes of alcohol in 100 millilitres of breath when she was tested. The legal limit is 35. Cutler, of Sydney Terrace, Trawden, Colne, admitted driving with excess alcohol on Keighley Road, Colne, on Sunday, October 15th. She was fined £180 with a £30 victim surcharge and £85 costs and was banned for 18 months. Trevor Grice, defending, said Cutler had been driving for 27 years and "had never had so much as a parking ticket. " She had apparently been " pressured" by family members to take her car to the wedding venue so they could have a lift and then would all get a taxi back. Mr Grice said: "Aswell as seeing her ex-husband, the date of the wedding coincided with the anniversary of the death of her father. "She became a little bit upset. She decided, regrettably, she would take her car back home. " Bench chairman Graham Jagger told the defendant: "We understand what took place, but nevertheless driving with excess alcohol is the issue here."